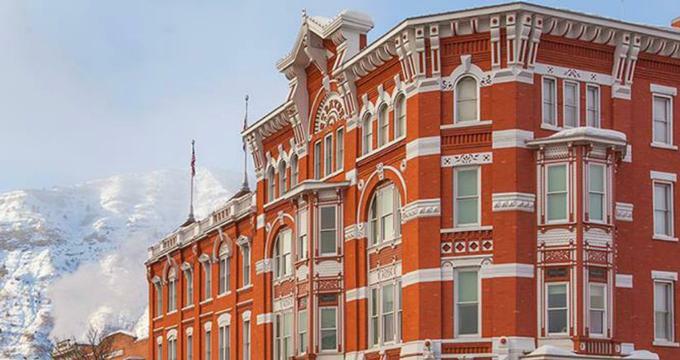 Built in 1887, the historic Strater Hotel is a prominent landmark in the town of Durango, Colorado that offers luxurious accommodations, fine dining and an array of lively entertainment. Owned and operated by the Barker family for three generations and one of the West’s iconic establishments, the Strater Hotel is adorned with beautiful handcrafted woodwork, classic period wallpaper, and is home to the largest collection of American Victorian walnut antiques which adorn the guestrooms. 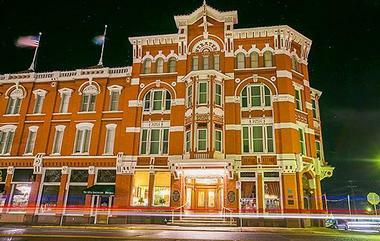 The Strater Hotel features an array of excellent dining and entertainment options, including the Mahogany Grille, the Diamond Belle Saloon, and the Henry Strater Theater. The hotel is ideally located for enjoying all that Southwest Colorado has to offer in the way of activities and adventures, including hiking, biking, climbing, skiing, river rafting, natural mineral hot springs, jeeping and more. The Strater Hotel is located two blocks from the Durango & Silverton Narrow Gauge Railroad, an hour’s drive from Mesa Verde National Park, and a few hours’ drive from the Four Corners Monument. 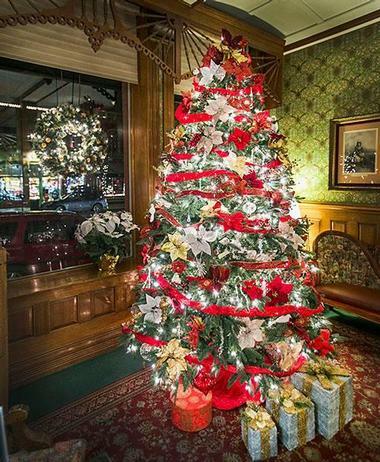 The Strater Hotel features 93 well-appointed and tastefully decorated guest rooms and suites adorned with beautiful handcrafted woodwork, classic period wallpaper, and American Victorian walnut antiques. Guest rooms are available in a variety of configurations accommodating up to six guests with three room types - Classic, Deluxe, and Premium. All guest rooms include comfortable double, queen or king-size beds with luxury linens, tiled en-suite bathrooms with showers, bathtubs, and organic bath products and modern amenities, including air-conditioning (only available seasonally), flat screen and cable television, clock radios, sound machines and voicemail services. Classic Guestrooms are stylishly appointed and uniquely decorated and furnished with American Victorian antiques and modern conveniences. Cozy in size, these delightful rooms offer an Old Victorian West experience for the budget traveler. Deluxe Guestrooms are slightly larger in size than the Classic Guestrooms and located near the front of the hotel with easy access to the restaurants, bars, and theaters. Premium Guestrooms are regal and spacious with small sitting areas featuring dining tables and chairs, upgraded accessories such as plush bathrobes, and a prime location which offers easy access to the restaurants, bars, and theaters. Guests can dine at the Mahogany Grille, the Diamond Belle Saloon, and the Henry Strater Theater. The Mahogany Grille is a fine dining restaurant decorated in an elegant Victorian style that serves a menu of authentic southwestern cuisine along with fine wines and spirits served by professional culinary staff. Guests can enjoy a Strater breakfast at the Grille, featuring hot and cold dishes, fresh fruit and juices and hot coffee and tea. World-renowned ragtime piano bar, The Diamond Belle Saloon takes guests back to the time of swanky cowboys and beautiful girls and offers vibrant entertainment in the form of daily lunch specials, live music and happy hours year-round. The Office Spiritorium exudes Victorian elegance and charm while providing daily happy hour specials, live music, and an extensive menu of imported spirits, handcrafted cocktails, and fine wines from around the world. 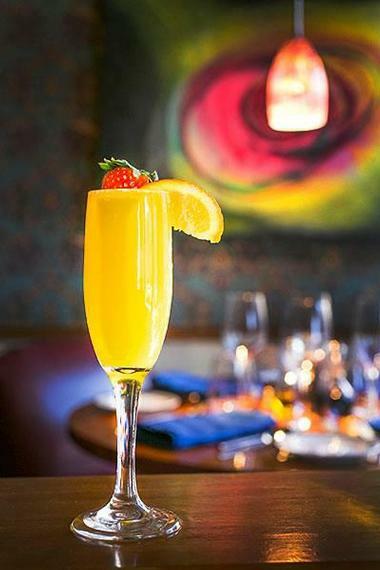 Guests can enjoy a complimentary Strater breakfast at the Mahogany Grille each morning, featuring hot and cold dishes, fresh fruit and juices and hot coffee and tea and post-dinner drinks and live music at the Office Spiritorium. The Henry Strater Theatre boasts exquisite Victorian décor and presents a calendar of shows throughout the year including music concerts, comedy, live theater, and more. The hotel is ideally located for enjoying all that Southwest Colorado has to offer in the way of activities and adventures, including hiking, biking, climbing, skiing, river rafting, natural mineral hot springs, 4x4ing and more. 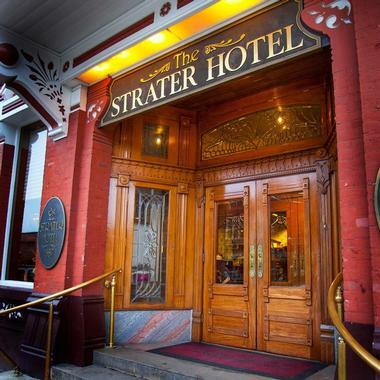 Located in the heart of one of the most beautiful places in the world, The Strater Hotel is the perfect place for a romantic or destination wedding, reception, anniversary or other special occasions for guests who share a love for the outdoors and the Old West. The hotel’s very own Strater Catering & Events Company offers an array of unique venues at the hotel including the grand Pullman Room, which can accommodate up to 130 guests. The company also provides award-winning catering with fresh and unique menus featuring local and international cuisine accompanied by fine wines.